In order to obtain a guarantee on Mul10 ProSafe products, the installation may only be performed by registered Mul10 ProSafe Installers who have completed the training/course at Mul10Metal A/S. After completing the course at Mul10Metal A/S, the registered installer is allowed to install all of the Mul10 ProSafe products, and to carry out quality control and the annual inspections. 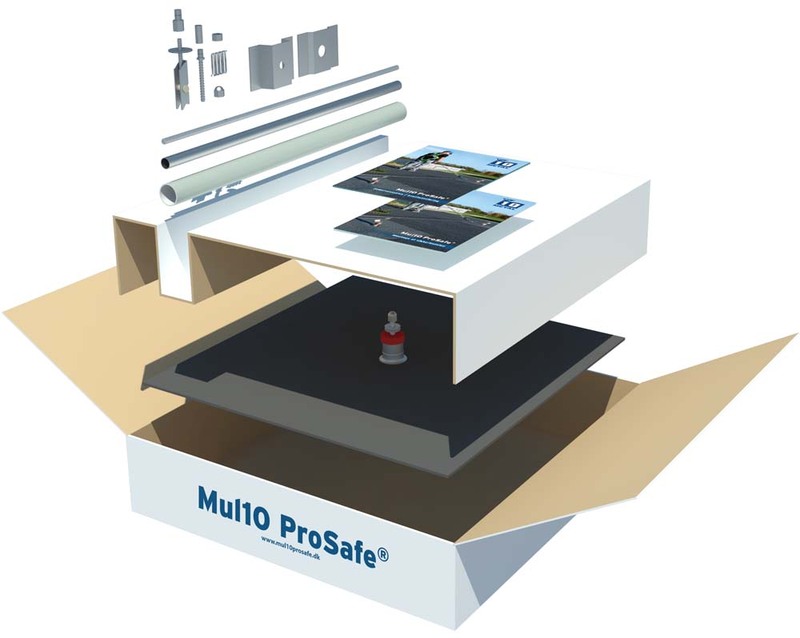 Mul10 ProSafe is a professional anchor system for personal safety on felt and foil roofs. Mul10metal’s patented safety anchor is the smart solution when you need to install fall protection on felt and foil roofs. The Mul10 ProSafe safety anchor acts as an anchor point for fall protection. It is centrally mounted and equipped with an integrated felt flange, which ensures a fast and tight installation. Where other systems require special installers, we train your roofing contractor to be a certified installer of Mul10 ProSafe. We give up to fifteen years in density warranty – the same as the roof’s guarantee. Simple (free) training for becoming a registered installer. Upselling can be achieved by selling subscriptions of the annual service (legal requirement). Fast and secure assembly (centre, instead of corner mounting). The roofing contractor can be safeguarded from day one. The roofing contractor can offer to install fall protection immediately (with other systems a specialist company must first be requested). We follow the applicable rules pursuant to the warranty, cf. AB 92. In addition to the general 5 year product warranty, the Mul10 ProSafe safety anchor follows the applicable roofing felt manufacturer’s warranty (typically 10-15 years), provided that the installation thereof is performed by a registered Mul10 ProSafe Installer and in accordance with Mul10Metal’s assembly instructions. In the case of projects with extended warranty on the roofing felt roof the Mul10 ProSafe safety anchor follows this warranty – Contact Mul10metal for further information regarding the extended warranty. Mul10 ProSafe has been tested and certified in accordance with the standards listed below in cooperation with the Technological Institute. The tests have been carried out in accordance with DS/EN 795:2012: Personal Fall Protection Equipment – Anchor Devices. Also DS/CEN/TS 16415:2013: Recommendations for anchor devices for use by more than one person at the same time. The safety anchors are packed in boxes with complete assembly kits for both hot and cold roof – for concrete, steel and plywood. The safety anchor is located in the bottom of the box so that the roofing felt remains flat. That is why the product now lends itself in an optimal way to have standing in inventory. In each box cutting templates, an installation guide and forms for documentation/quality assurance are also included.